Going into Pivot Point, I honestly didn’t know what to expect. I hoped that I’d enjoy it -( Kasie West is a local author), and I did end up loving it – I just wasn’t sure of what to expect going into it. It seems that every year there are books that everyone seems to enjoy, and Pivot Point is definitely one of those. The book started of a little slow for me, but slowly I started to become invested in Addie’s story. 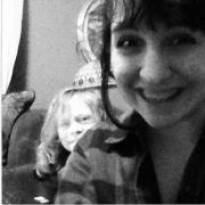 We’re seeing these two different possible outcomes to her future play out, and you guys. It’s both addicting and infuriating. Come a certain point, you’ll know which future you want her to pick, and from there on you won’t be able to set the book down. Without delving too far into the plot of Pivot Point, I can say without a doubt that the way Kasie West told Addie’s story was incredible. The book follows Addie as she uses her ability to look six weeks into two possible versions of her future. The way it’s told is weird, and I mean that in the best possible way. Each chapter alternates between the two different futures, and I think that this way of telling the story could have very easily gone wrong, but thankfully it didn’t. It was actually really interesting because with both possible paths – you were able to see how closely they were linked. As the story progresses, little events start to match up, and I was literally pointing everything out and muttering to myself things like “this makes sense now” – it was great. One of my favorite things about Pivot Point was the world that the characters lived in. This book is one of those rare ones where it’s a science fiction/paranormal type story that reads like a contemporary. However, as much as I loved the world building and how unique it was, I still have a ton on questions that I’m hoping will be answered in the sequel. Throughout the book there are little things here and there mentioned, but not entirely explained. I could definitely do for a bit of background history on “The Compound” and why only a select group of people have the mind abilities mentioned throughout the book. Holy freaking romance! I loved the romantic element in this book so hard. Seriously. Throughout the entire book we’re seeing these two different scenarios for how Addie’s life may end up, and you’ll literally be feeling all of the feels. For awhile I was loving both guys – I was quoting Hannah Montana and telling myself that it’s the “best of both worlds” and that I’d be happy with whatever life she ended up choosing. But somewhere along the way, I found myself rooting for one guy more so than the other, and then a certain event made up my mind. Not that the guy is the deciding factor for which path she ends up choosing, because it isn’t. There is so much more to the story than the romance, but it was definitely a good one that I enjoyed. 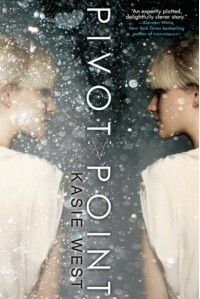 Overall, Pivot Point is a book that anyone who is a fan of the paranormal/sci-fi genre should read. It’s definitely one of the books that I consider a must read of 2013, and think that fans of both the contemporary and paranormal sci-fi genre will enjoy. The book also leaves off on one those endings that isn’t a cliffhanger, but leaves you with enough questions that you’re dying for the next book.